The primetime matchup this week is one of the best of the year for Thursday Night Football as the first-place Colts head to Tennessee to on the Titans at LP Field. These two teams are separated by two games in the standings and will play each other twice in the next two weeks. Last week was devastating for the Titans, the team not only loss to a previously winless team in the Jacksonville Jaguars but also lost their starting quarterback for the rest. Despite outgaining the Jags 362 yards to 214, the Titans could not overcome their three turnovers, losing the game 29-27, dropping their record to 4-5 on the year. Quarterback Jake Locker went down early the game with a Lisfranc injury and will require surgery. This ends the season for Locker and forces backup Ryan Fitzpatrick into a full time starting role. Fitzpatrick is a journeyman quarterback who spent most of this time in buffalo and will be a significant downgrade the position. In relief of Locker, Fitzpatrick has looked good so far. He threw two touchdowns last week and completed 22 of 33 passes for a passer rating of 111.2. The Colts have started off strong this season with a 6-3 mark. However, they lost by their largest margin of the year last week, losing 38-8 to the St. Louis Rams. Andrew Luck has had an outstanding season but had his worst start of the year against the Rams. He threw for 353 yards but just one touchdown and three interceptions in the loss. Indianapolis continues to suffer from suspect play calling and a running game that is nearly nonexistent, along with woeful play from their offensive line. Luck has protection problems every game and Trent Richardson has been a bust in Indy. At most sites, the game is listed at Titans +3 at standard juice while lines of 2.5 will be usually be listed at -115 or higher. The game opened at Titans +3 at most shops. The total opened at 42 and is listed at that number at most sportsbooks but is trending upward toward 43. 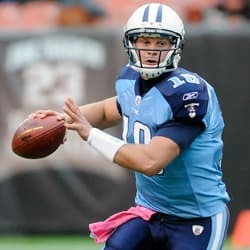 The loss of Jake Locker is tough for the Titans, but Fitzpatrick has been more than serviceable in his NFL career, and Tennessee’s skill players are a bit underrated. A week with first team reps may do him wonders learning this offense. The Colts are 6-3, but question marks are all around this franchise. The offense has not recovered from the loss of Reggie Wayne and one can easily tell that this team has some question marks with their play calling. With a below average passing attack and no running game, lots of pressure is put on the defense which while improved, is not one of the league’s best. If the offense can’t move the ball easily and score 20 or more points, I think this defense suffers. I’m not sure they will be able to move the ball through the air against the Titans tough secondary that should cause some problems. Also, though Tennessee’s rush defense is one of the worst in the league, the Colts can’t seem to get their running game going no matter whom they play. The Titans are at home and can control this game if they play their gameplan and stick to the run. Wide receiver Kendall Wright has been outstanding as well and will be a nice target for Fitzpatrick down field. At this point in the season, the Colts are one of the most overrated teams in football. They almost lost two weeks ago against Houston before coming back and got demolished by a St. Louis team last week. Take the home dog Titans +3 with Bovada.lv.